It's officially 'Cuffing Season' and the dating pool is now full of fish once again. As a single, professional, disabled woman, I decided this is the year I recommit to dating and my journey of finding viable candidates for the title of Mr. Right. Yes, I am going to dip my toes back into the dating pool, and decided to share why for the BraunAbility blog. I have chosento try the online dating route again...for the umpteenth time. Online dating and I have a very dysfunctional relationship, mainly because I seem to have the apparent misfortune of attracting "interesting and peculiar" characters on dating websites. I usually am adamant about online dating for a month or so, and then give up due to the lackluster dating options available. Being someone who is a social butterfly, loves going out, and is willing to try new things, my dating profile seems to attract men who are the complete opposite; though opposites may attract, these candidates were not compatible to me. Finding compatible mates as a disabled woman does not come without its challenges. I am a career woman who is busy with working on expanding her advocacy business and searching for writing opportunities. I am researching JD and PhD programs, writing a children's book, and involved in my community. Being too busy to muster up the energy for either "traditional" or online dating has proven to be a barrier I want to overcome. If I declare that I would like to have someone to spend time with, then I must maketime to meet people, whether face-to-face or virtually. Truthfully, dating can be, and is at times, tiring, but the alternative (being currently single) is even more of an emotional drag than putting myself out there. Being a disabled woman presents its own unique struggles, which has contributed to my own dating mishaps. 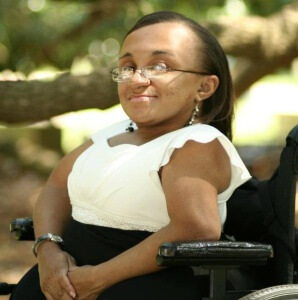 These struggles relate largely to people erroneously believing that disabled women are not interested in dating, will date "just anyone," or cannot be "picky" because they should be "grateful" to have someone willing to date them in the first place. All of these offensive ideas stymie our ability to date confidently online and in person, and do notallow potential romantic suitors to view us as equal to our non-disabled counterparts. These misperceptions have caused many disabled women to shy away from dating altogether, and have impacted our understanding of our sexuality, femininity, womanness, and dateability.Though there may be some barriers to conquer during the dating experience, I do know one thing for certain: everyone deserves, and is deserving of, good, healthy, fulfilling relationships and to date people who value who and what they are-disability and beyond. No one should "settle" for relationships that are unsatisfying or abusive just because they are disabled-happiness is not only for non-disabled people. My dating adventures may take a few twists and turns along the way, but I am striving to meet my Mr. Right, and to have some fun and interesting tales while on this journey.